A few weeks ago, I picked up a copy of Milk Street magazine, the new culinary endeavor by Chris Kimball (of Cook’s Illustrated and bow tie fame). It was one of their special issues entitled Simply Supper which immediately caught my eye since keeping dinner interesting yet simple is a never-ending task for me. I didn’t realize who the publisher was until I started flipping through the pages and saw one recipe after another that intrigued me so much I had to find out who the recipe creator was. I was surprised when I looked back at the cover and saw the publisher was Milk Street. The reason for my surprise was because I had actually ordered the charter issue of the magazine when Chris Kimball introduced it last year. However, I honestly found the charter issue to be underwhelming and decided I wasn’t going to be adding Milk Street to my subscription list. Fast forward 10 months and I find myself re-considering that decision. I’ve made a couple of excellent recipes from the Simply Supper issue now and have several more flagged to try next. This recipe for chipotle shrimp tacos was one I tried and loved. After having auditioned other recipes for chipotle shrimp tacos that were all spice and not much else, I was happy to find a recipe that struck a balance of spicy and smokey. I did tweak the recipe a bit to fit my own taste preferences because that’s just what I do (even to my own recipes). I substituted canned whole tomatoes for the “vine-ripened tomatoes” and I added some smoked paprika to up the smokiness of the chipotle chilis. I’m really not a fan of spicy foods so I tend to be very conservative with how many chilis I use and the recipe below reflects that. Feel free to add as many chilis as you can handle. The original recipe called for 4 chilis. I also recently discovered chipotle paste in a tube similar to tomato paste concentrate in a tube that has been available for awhile. After throwing out numerous half-used cans of chipotle chilis over the years and always struggling to remove seeds from the chilis, I couldn’t be happier about finding chipotle paste. It’s super convenient and makes this recipe come together even faster. Although I didn’t intend for this post to become an advertisement for Milk Street and they certainly didn’t pay me to review them (gosh, wouldn’t that be nice), I do honestly think they’re worth a second look. I’ll let you know how the other recipes turn out. In a food processor, blend together the tomatoes, chipotle chilis, paprika, and a generous pinch of salt until mostly smooth. Set aside. Heat 2 tablespoons of olive oil in a large non-stick skillet over high heat. When the pan is very hot, add half the shrimp and sear until shrimp are golden on both sides. Transfer the shrimp to a bowl. Add 1 tablespoon of oil to the pan and repeat with remaining shrimp. Set aside. Return the skillet to medium-high heat and add remaining 1 tablespoon of oil. Add the onions and cook until onions have softened and begin to brown. Stir in wine and any accumulated juices from the bowl of shrimp. Cook until most of the liquid is evaporated. Add the chipotle mixture and simmer, stirring occasionally, until sauce is thick enough to coat a spoon, 7-10 minutes. Remove skillet from the heat and stir in the shrimp. Cover and let sit until shrimp are cooked through, 2 to 4 minutes. Stir in chopped cilantro and lime juice. Season with salt and pepper to taste. 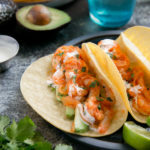 Serve shrimp in tortillas topped with avocado, sour cream, cilantro, and a squeeze of lime juice.